St John's Church, Park Street, Taunton TA1 4DG are very kindly raising funds for the MTC at their lunchtime concert on Friday 14th June 2019, 12.45 - 13.30. See here for full details and please do along if you're in the area. FREE ADMISSION, retiring collection in aid of MTC and St John's Church. - It will be the first World Congress to take place in Africa and we understand that several other African countries are on the brink of mobilising practice and training. These are exciting times and a successful Congress will give this growth a real push! - For many this Congress is a tanglible legacy of Mercedes Pavlivovic's life's work. Mercedes was a valued member of the MTC Research Commitee and without her efforts there would be no Congress in Africa. She would have loved to see what it could achieve and what fun it could be. PLEASE USE YOUR PERSONAL/PROFESSIONAL CONTACT NETWORKS TO GET THE INFORMATION OUT NOW AND SPREAD AWARENESS. Abstract deadline is 29th April 2019. Click here for further details. Today is World Music Therapy Day! There are celebrations around the world and if you search worldmusictherapyday there should be much to see and warm the heart. The webpage worldmusictherapyday.com has links to numerous professional associations and media in a range of languages. We are sad to announce the death of André Previn KBE on 28 February 2019 at the age of 89. He was a long-standing Vice-President of the Music Therapy Charity and we are very grateful for his support over the years. Congratulations to our President, violinist Nicola Benedetti, who was appointed a Commander of the Order of the British Empire (CBE) in the 2019 New Year Honours List, for services to music. 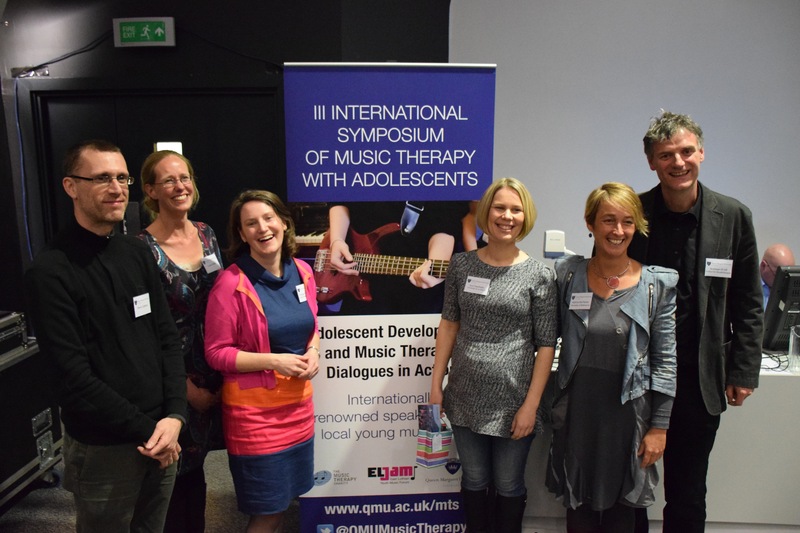 The Music Therapy Charity is currently inviting its next round of proposals from music therapists (including research students) to support research. Grants may be made to help with such costs as part-time salary for fixed periods, academic or clinical supervision, and collection and analysis of data. With a limited annual research budget (currently £15,000) we invite applications for small grants to go towards funding of projects, some of which are likely to be co-funded from other sources. All areas of music therapy research will be considered. To apply, please submit a concise summary of the project using the application form provided at www.musictherapy.org.uk/small-grants-how-to-apply. Typical grant sums awarded are up to £1,500. The deadline for submissions is 31 January 2019 and funding outcomes will be communicated to applicants by the end of March 2019. The Music Therapy Charity is delighted to announce that they have agreed to award funds to support a three-year PhD Fellowship to the Division of Psychiatry and Applied Psychology, Institute of Mental Health, University of Nottingham, to be supervised by Professor Martin Orrell & Dr Orii McDermott. In an open competition it was felt that while all applications received were of a very high standard, that from the Nottingham group was the best fit with the intentions of the call for proposals. The holder of the Fellowship will develop and evaluate a UK version of the Person Attuned Musical Interaction in Dementia Manual (PAMI-UK), the original version having been created in Aalborg in Denmark by a team that included Dr McDermott. The aim of producing and evaluating a UK version of the PAMI is to provide a culturally appropriate manual for care home staff to promote attuned interactions with residents with dementia, and to raise an awareness of the potential benefits of music therapy skill-sharing amongst music therapy clinicians and researchers, and dementia care specialists. The Music Therapy Charity is very pleased to be able to have facilitated this important research, which we expect will have benefits not only for patients but also for all involved in dementia care. We are sad to announce the death of Richard Baker on 17 November 2018 at the age of 93, who was a long-standing and active Vice-President of the Music Therapy Charity (MTC). He was the first newsreader on BBC television and was also a keen musician, playing the cello and piano, and presented many musical programmes on both radio and television, including live TV presenation of the Last Night at the Proms, Your Hundred Best Runes for BBC2 and was a regular panelist on the classical music quiz show Face the Music. The Governors of the MTC were amazed and delighted to share his wonderful enthusiasm for music, and the generosity of spirit and interest which he was so willing to give to music therapy. All through his time as Vice-President of the MTC the charity benefitted from his firm commitment and encouragement of the charity's research work. It is with great sadness that we report the death of Mercedes Pavlicevic. She died peacefully, after illness, in June 2018. Mercedes was a member of the Research Committee of the Music Therapy Charity, previously was Director of Research at Nordoff-Robbins, London. During a career dedicated to Music Therapy, Mercedes worked with children, adults and older people in a range of institutional and community settings in England, Scotland, South Africa and Lebanon. She co-instituted South Africa's first accredited music therapy training programme and was Director of the Master in Music Therapy programme at the University of Pretoria until 2006. Mercedes was author, co-author and editor of many key music therapy publications, and her enthusiasm, passion and expertise within the field of music therapy is greatly missed. The deadline for submissions is 31 July 2018 and funding outcomes will be communicated to applicants bythe end of September 2018. The Governors of the MTC are delighted to announce that for the next academic year we are doubling the funding of MA Bursaries from £2,000 per music therapy school per year to £4,000. This is in response to a demand from students who are finding it increasingly difficult to obtain funding. Maya Sherwin who is researching "The role of traditional Amazonian songs as therapeutic tools in psychol-emotional healing: A phenomenological study of musical experiences during the ceremonial practice of traditional medicine at Takiwasi." Irene Pujol Torras who is researching "The use of Group vocal improvisation in a mental health setting." The Music Therapy Charity, together with BAMT (British Association for Music Therapy) will be hosting a stall at the Roundhouse Rising Festival on Saturday 3 March. We look forward to seeing you there. The Music Therapy Charity is proud to be supporting #WorldMusicDay today and to be funding vital research into music therapy. We are excited to be able to report that the International Longevity Centre - UK (ILC-UK) has published a report examining the existing landscape and future potential of using therapeutic music with people with dementia. Here is a link to the Guardian article of 18/01/18 which itself includes a link to the full report. With a limited annual research budget (currently £15,000) we invite applications for small grants to go towards funding of projects, some of which are likely to be co-funded from other sources. All areas of music therapy research will be considered. To apply, please submit a concise summary of the project using the application form provided on the Small Grants - How to Apply page under the heading What We Fund. Typical grant sums awarded are up to £1,500. The deadline for submissions is 31 January 2018 and funding outcomes will be communicated to applicants by the end of March 2018. Here is a link to the BBC Radio 3 broadcast on music therapy and mental health which was an initiative arising from research, partly funded by the MTC, carried out by Kate Jones, Head of Music Therapy, Lambeth and Anglia Ruskin PhD student. The programme features Dr Catherine Carr, Governor of the MTC, talking about her research in acute hospitals and Kate Jones sharing her research on children with selective mutism. New BBC documentary about music therapy and the importance of research in this field. This was created by Kate Jones, a PhD student of one of the MTC Governors at Anglia Ruskin University, who also received an MTC small grant towards the cost of her PhD and works at Music Therapy Lambeth. We are delighted to announce that Dr Neta Spiro has agreed to join the Research Committee of the Music Therapy Charity. Dr Neta Spiro is Head of Research at Nordoff Robbins and teaches at the Faculty of Music, University of Cambridge. Her research is driven by exploring how and why people participate in music as well as whether, how and why music helps people. Her background is in music and cognitive sciences and her research has previously explored the relationships between music theory, performance and perception (at Royal Holloway, University of London); the perception of musical phrases in western classical music (during her PhD); and the use of music therapy in dementia care (at the North East London NHS Foundation Trust). In her music therapy research she is interested in exploring what happens in music therapy, how it is viewed by people who engage with it in different ways, and what the effects of music therapy are seen to be. She work with students on the Nordoff Robbins Master of Music Therapy and PhD courses and at the Faculty of Music, University of Cambridge. Following the December Call for Small Grant applications MTC is pleased to announce that 4 new grants to assist with costs involved in the following very interesting and valuable projects. Results of the research will be published on our website in due course. Phoene Cave: Singing for Lung Health - A creative study day to capture the patient experience of breathlessness and breath management in relation to Singing for Breathing. This will inform further research into the mechanics of the breathing mechanism as used in supported singing. Claire Flower: Music Therapy for Children and Parents in a Child Development Service: A Qualitative Study of the Dynamics of Expertise. John Strange: The Effect of Improvised Music on Intensive Interaction - Does improvised music as an adjunct to Intensive Interaction enhance the development of communicative interaction? Giorgos Tsiris: Evaluating Nordoff Robbins music therapy services in the UK: Exploring the applicability and transferability of impact areas. MTC Governors attended a concert at the Royal Festival Hall on 18th March 2017 conducted by our Vice-President Benjamin Zander who had flown over from the States for this performance as well as recording. The programme consisted of an all Beethoven evening: The Coriolan Overture - Piano Concerto No.3 in C minor, soloist Mei Yi Foo, and Symphony No. 9 in D minor 'Choral'. The concert was a sell-out and Ben had a standing ovation at the end. We are greatly saddened to hear that our Vice-President Lady (Anne) Badenoch died on 13 February 2017 aged 94. She was a faithful Governor and supporter of MTC and we extend our heartfelt condolences to her family. Ian teaches in the Faculty of Music at the University of Cambridge, where he is Professor and Director of the Centre for Music and Science, leading a lively group of graduate students and postdoctoral researchers in exploring music, its materials and its effects from a wide range of scientific perspectives. His early research helped set the agenda for the study of music cognition; he has since published widely in the field of music and science, from the psychoacoustics of violins to the evolutionary roots of musicality. His current research focuses on exploring relationships between speech and music as interactive media. He is a Fellow of Wolfson College, Cambridge, a classical guitarist, and a Trustee of SEMPRE, the Society for Research in Psychology of Music and Music Education. Val has been involved with the charity for several years primarily co-creating and running events to raise funds. Prior to this she worked within two London universities; firstly at the London School of Hygiene & Tropical Medicine and then King’s College, London. Prior to that her experience was within the commercial sector working for British Petroleum. The Music Therapy Charity is currently inviting its next round of proposals from music therapists (including research students and professionals) to support research. Grants may be made to help with such costs as part-time salary for fixed periods, academic or clinical supervision, and collection and analysis of data. The deadline for submissions is 31st January 2017. We are greatly saddened to hear the news of the death of our President, the late Sir Neville Marriner, and extend our heartfelt condolences to his family. MTC awards 5 new "Small Grants"
Twice a year we invite proposals from music therapists/students seeking grants to support research eg to assist with part-time salary, academic or clinical supervision, and collection and analysis of data. We are delighted to announce that following our May Call for applications we have now awarded 5 new grants of up to £1,500 to students involved in very interesting research projects ranging from the involvement of carers in music therapy to methods of music therapy for children with a history of abuse/neglect. We wish them every success in their studies and look forward to receiving their reports at the end of their studies which will be published on our website. Many thanks Mari from us all at MTC. a fantastic occasion all round. just paid to you via PayPal. I've attached a picture of me at about 23.5 miles! 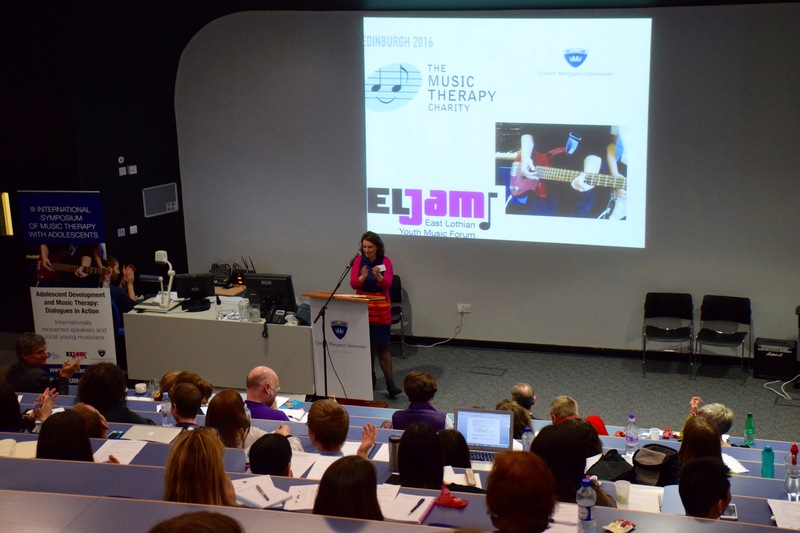 I am writing to thank you very much for supporting, by generously sponsoring, the III International Symposium of Music Therapy with Adolescents so generously at Queen Margaret University, Edinburgh in April. I attach a copy of the packed programme and three photographs from the day. 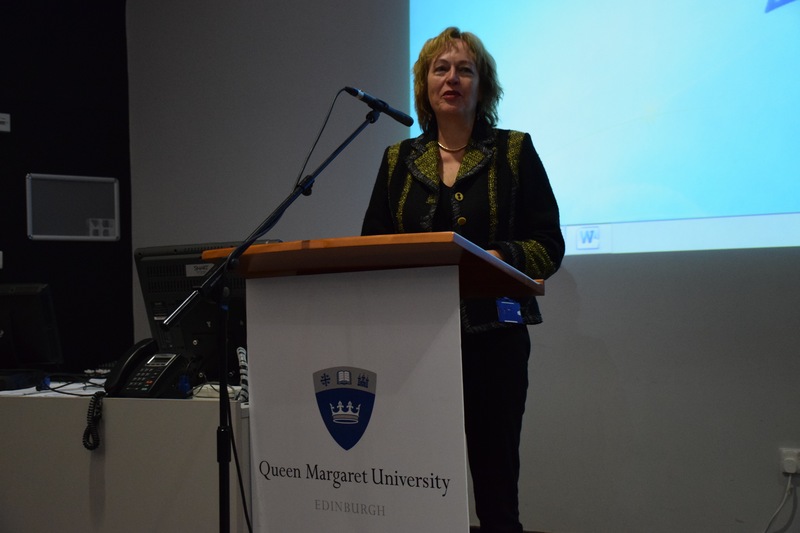 The event was supported by Queen Margaret University and the Principal, Professor Petra Wend, welcomed everyone at the start. It was an enormous success and many delegates wrote to thank us for hosting this event for MT in Scotland. As one delegate wrote, The symposium was fantastic - quite the best MT event I've ever attended - and I've taken away a mass of ideas, new perspectives, much inspiration and an extensive reading list! The energy and the sense of learning in the room were astonishing. It was such an insightful and engaging day. Great variety of thought-provoking talks, and it was especially powerful to incorporate live performances and thoughts on music from adolescents. So impressive that you secured funding so that it was all free to attendees too! Very much appreciated. It was a milestone for music therapy in Scotland and I thank you so much for your support. A wonderful evening was had by all at 'Jazz Age at the Savoy' on March 10th 2016. In the evocative setting of the Cinema Museum, Kennington we were drawn into the heady world of cocktails and jazz by Alice Lascelles, journalist and James Pearson, pianist. Music Therapy Charity Governor, Helen Odell-Miller OBE completed the experience with a fascinating insight into the measure of the work that music therapy can do, in so many spheres. Thank you to our performers and to everyone who supported the event! As part of Music Therapy Week the Guardian published this excellent article featuring 'a day in the life of' Professor Helen Odell-Miller, a Governor of the Music Therapy Charity. Many thank to Helen for providing such a fascinating account of her work and drawing attention to the latest research findings for music therapy in dementia care. For details of the upcoming conference on the topic Sept 4 - 6 at Anglia Ruskin University, download Music therapy and dementia care in the 21st century. Many congratulations to our President Sir Neville Marriner on his appointment as a Companion of Honour in the Queen's Birthday Honours list. This year’s Music Therapy Week is focusing on the valuable role music therapy has to play in supporting people with dementia and those who care for them. Leading research has shown that music therapy can significantly improve and support the mood, alertness and engagement of people with dementia, can reduce the use of medication, as well as helping to manage and reduce agitation, isolation, depression and anxiety, overall supporting a better quality of life (Ridder et al, 2013). Music therapy can help people at all stages in their journey with dementia to enrich life and tap into the resources that people with dementia still have. 81-year-old David Jacques was diagnosed with both vascular dementia and Alzheimer’s disease four years ago. He has progressive short-term memory loss, experiences difficulty organizing his time and sometimes gets lost. ‘David came to his first music therapy session armed with books of folk songs and opera,’ recalls Pemma Spencer-Chapman, a music therapist at the Guideposts Trust Music Therapy Service in Oxfordshire. 'This was unusual,' she says, 'as most clients don't have any musical training. If I played or sang the melody, David could hold the tune. He sang the melodies increasingly from memory and marveled at his brain’s ability to remember them’. The brain remembers emotional experiences more easily than facts, and the emotional nature of music helps these memories come to the fore. ‘I feel more alive and happy after each session’, David. Over 800,000 people live with dementia in Britain and this is expected to increase to 2 million by 2050. Currently, provision of music therapy for people with dementia is uneven across the UK and those diagnosed are often not able to access it when they need to. Pemma is one of over 800 HCPC state registered music therapists who use the unique non-verbal properties of music to support people at all stages of their lives – from helping new born babies develop healthy bonds with their parents, to offering vital, sensitive and compassionate palliative care at the end of life. Events for Music Therapy Week are taking place throughout the week from Shetland down to Truro including a parliamentary roundtable discussion sponsored by MPs Tracey Crouch and Debbie Abrahams, taster music therapy sessions, open days, exhibitions, and live improvisational gatherings. · A week of instrument making, concerts and tea parties for the children and families at Rainbows Hospice in Loughborough, All week. Find out more about what’s happening during Music Therapy Week 2015, view our MTW2015 Events Map. A huge thanks to the staff and pupils of St Thomas More School, Buxton for your generous donation following the whole school Talent Show held by the GCSE Music Group during Lent, 2014. 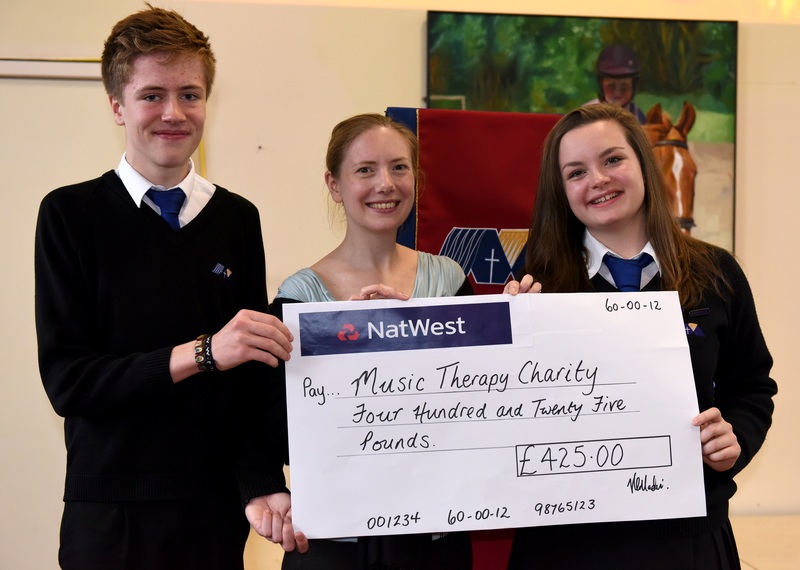 Particular thanks to Charlie Denton, a past pupil, who was extremely proactive in the organisation of the event and who suggested raising money for The Music Therapy Charity (MTC). In the photo is Will Cruddace, Head Boy, Catherine Carr, Governor of the MTC and Niamh Macnamara, Head Girl of St Thomas More School. Thank you and congratulations to a school with such talented pupils!! 'Music Therapy - The Art and Science' is on exhibition at the Barbican Music Library until 31st October 2014. As part of the City of London’s Culture, Heritage & Libraries series, the Barbican Music Library is hosting a free exhibition by the British Association for Music Therapy. ‘Music Therapy – the Art and Science’ presents a visual history of music therapy, with original documents, music scores, letters and influential publications that plot the development of music therapy in the UK. Drawing on the rich experiences of music therapists and service users, their families and carers, the exhibition is a fantastic opportunity to learn about music therapy and understand the impact it has on our lives. Vinnie French, father of a young autistic boy, described his son’s experiences of music therapy as life-changing and the most successful intervention he had access to in supporting his development. Donald Wetherick, Chair of the British Association for Music Therapy said the exhibition demonstrates powerfully the role music therapists play in supporting some of the most vulnerable people in our society every day. Prof. Leslie Bunt MBE, professor in Music Therapy at the University of the West of England said the exhibition also clearly demonstrates the development of music therapy within the UK. The exhibition opened on Wednesday 3 September and runs until Friday 31 October 2014. Many congratulations, once again to our President, Sir Neville Marriner. At the 2014 Gramophone Awards, Sir Neville was honoured with an Outstanding Achievement Award in recognition of his prolific recording career. Congratulations to MTC President, Sir Neville Marriner on his 90th birthday celebrations! From all of us at The Music Therapy Charity, warmest congratulations to Sir Neville Marriner on your extraordinary and wonderful achievements! We look forward to hearing and seeing the continuing celebrations in the lead up to your 90th birthday. Thank you for your support as our President. Music therapy in dementia care and heart surgery for children advanced by concert proceeds. In January 2014, the Music Therapy Charity sponsored a concert in celebration of the life of Sir John Tavener at St John Smith Square, London. The performance by the English Chamber Singers and the Orchestra of St John’s was conducted by Martin Neary and soloists included Patricia Rozario soprano, Ann de Renais soprano and Josephine Knight cello. The concert included some of Tavener’s best known works, The Lamb and Song for Athene (performed at Princess Diana's funeral), and the UK première of Miroirs des Poèmes for choir and strings. The concert was introduced by the Bishop of London, The Rt Revd & Rt Hon Richard Chartres DD KCVO and proceeds were shared by the Music Therapy Charity Dementia Research Project and Chain of Hope, a charity started by Sir John's heart surgeon, Magdi Jacoub. 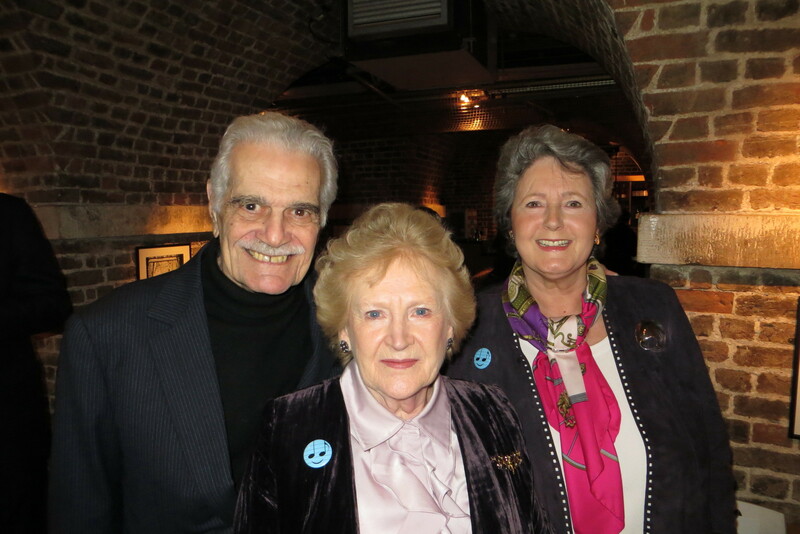 Omar Sharif, a fellow Egyptian and Patron of Chain of Hope, supported the concert and appeared delighted to be photographed with Governors of the Music Therapy Charity. See our Gallery for more photos of the pre-concert reception. 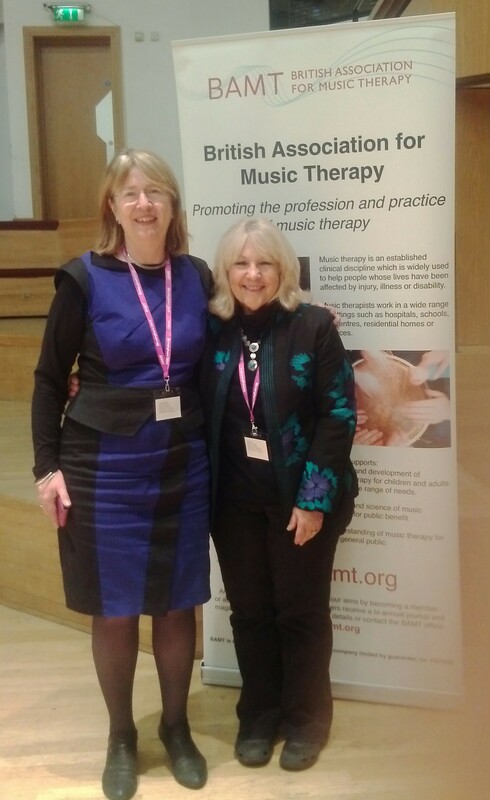 Professors Helen Odell-Miller and Cheryl Dileo at the first conference of the British Association for Music Therapy. The conference was opened by a fanfare in memory of Tony Wigram, one of the country's most eminent and influential music therapists. The piece was composed by music therapist, Gordon Thornett and is full of musical references familiar to the Wigram family. This was followed by the Tony Wigram Music Therapy Charity Reseach Fellow Lecture given by Professor Cheryl Dileo, Carnell Professor of Music Therapy, Temple University, Philadelphia. "How can you mend a broken heart? Music therapy and cardiac disease: an exploration of medical and psychological phenomena."